Clearly, the markets have seen a rocky start to 2016. With most major equity indices firmly in the negative, investor anxiety is at levels not seen in some time. In this environment, it is very easy to forget the market positives that still exist today. It is also important to remember that it can be easier to "hold-on" during times of volatility when your investments are tied to a "bigger picture" financial plan. Clearly, the markets have seen a rocky start to 2016. With most major equity indices firmly in the negative, investor anxiety is at levels not seen in some time. In this environment, it is very easy to forget the market positives that still exist today. Two primary factors weighing on equities so far this year are Chinese stock market volatility and weakness in crude oil prices. With respect to China, recent weak data has worried investors about that country’s economy. The slowing economic indicators have also caused the Chinese central bank to depreciate the Renminbi relative to other currencies, and further depreciation could trigger a currency war that may prove damaging to global economic growth. Keep in mind that an orderly depreciation of the Renminbi should stimulate the Chinese economy as its exports become cheaper to the rest of the world, and it may also be positive for global growth since China imports a variety of raw materials. Unfortunately, a lack of communication from the Chinese central bank regarding their currency plans has raised investor uneasiness. Regarding low oil prices, the current weakness is mostly caused by continued production increases from OPEC members, whose policy seems to have shifted to protecting market share instead of focusing on price. Weakness in the Chinese economy is another concern here, since, according to the Wall Street Journal, China consumes about 12% of world’s crude oil. A string of weak manufacturing data in recent months has fueled fears that an economic slowdown in China would affect its demand for oil. While lower oil price is a boon for consumers and energy-consuming industries (airlines) and countries (Japan, India), investors are concerned that a drop in crude oil prices may have more negative consequences to the global economy. The energy industry is not a stand-alone business, so a decline in oil prices does not just hurt energy companies—it may have a negative impact on capital and infrastructure investment. Industries that directly and indirectly support energy companies, such as insurance, lending, and equipment manufacturers, may decline as well. So, low oil prices could hurt overall corporate earnings, create layoffs, and reduce future capital expenditures. Lower oil prices are also hurting equity indices. Energy companies tend to be large, publicly-traded entities. In comparison, the broad economy tends to be dominated by smaller companies, with 60-70% of employment generated by small businesses. Therefore, the share of energy as a percentage of S&P earnings is higher than the percentage of energy as a portion of GDP. In other words, if oil prices are up, energy profits are higher as a result. Also, there are more exploration and capital expenditures, which are all positives for energy stocks and a boost for equity index performance. Lower oil benefits the consumer, but the benefit is more widespread and does not directly translate to higher equity prices. While the financial markets have really embraced the negative news, it is important to keep in mind that there are still positives for investors today. First and foremost, we are still in a historically low interest rate environment and, despite the recent Fed rate hike, global monetary policy is still accommodative. This environment has significant benefits for borrowers and potentially offers a support level to equities worldwide. Second, the key drivers of the U.S. economy remain intact with solid gains continuing in the housing and labor markets. Third, service industries are still showing broad strength. Fourth, inflation remains well under control. This item is important as some members of the Fed have noted that lower oil prices may cause headline inflation to slow and a return to the Fed’s 2% annual target may take longer than expected. If that is the case, it is possible to see fewer Fed rate hikes than the four expected by the financial markets for 2016. Looking forward, as investors weigh both the positives and negatives of lower oil prices and weakness in China, we believe elevated levels of market volatility will persist for some time. In fact, as the table below shows, market volatility has been here for some time. While volatility is elevated, it is important to keep a long-term perspective. 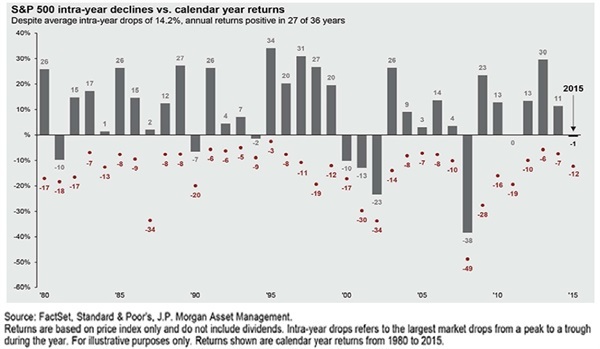 According to JPMorgan Asset Management in the chart below, the S&P 500 has generated positive annual returns in 27 of the last 36 years. However, the average intra-year loss in those years is 14.2%. While there is no guarantee that 2016 will end in positive territory, bouts of market volatility causing intra-year losses—like we have experienced so far in 2016—are not out of the norm. While we cannot predict what will happen over the next week, we believe the odds favor equities being higher in the next 12 months. Instead, it is more important to focus on the longer-term and brace yourself for short-term market fluctuations. With that in mind, we continue to suggest being more diversified than normal in your portfolios, incorporate alternative investments which have historically shown to offer protection in poor markets, and keep in constant in contact with us. For more information about Cetera Investment Management strategies and available advisory programs, please reference the Cetera Investment Management LLC Form ADV disclosure brochure and the disclosure brochure for the registered investment adviser your adviser is registered with. Please consult with your adviser for his or her specific firm registrations and programs available. statements are based on assumptions, may not materialize, and are subject to revision.